← A Funny Story Flashback—We Need to Get Out More! 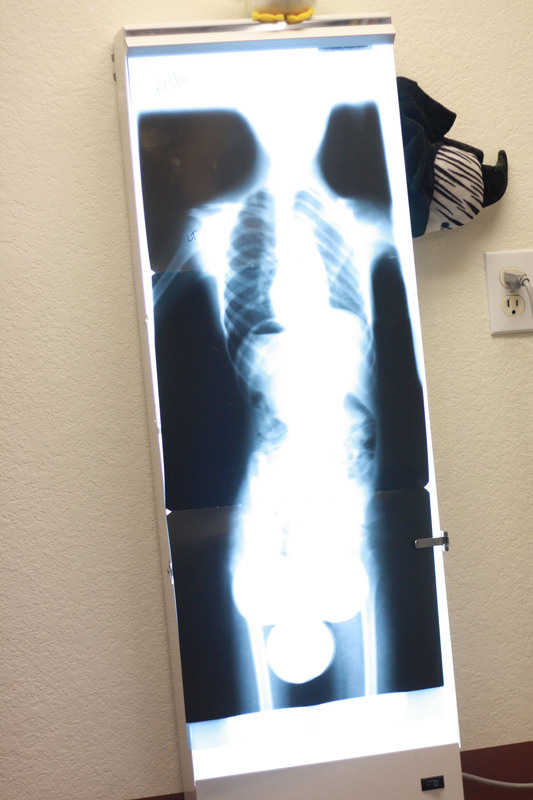 You remember a while ago when I told you that Olivia had severe scoliosis, right? Well, she finally got her brace. First we went and had the cast made. To me, it looked like a torture chamber. The only reason I can ever keep a brave face on and not crumble is because I have to be brave for her. I just hate to see her have to go through these things. The boys had to go with us too. You should have seen their faces. I think they have a newfound respect for their big sister. 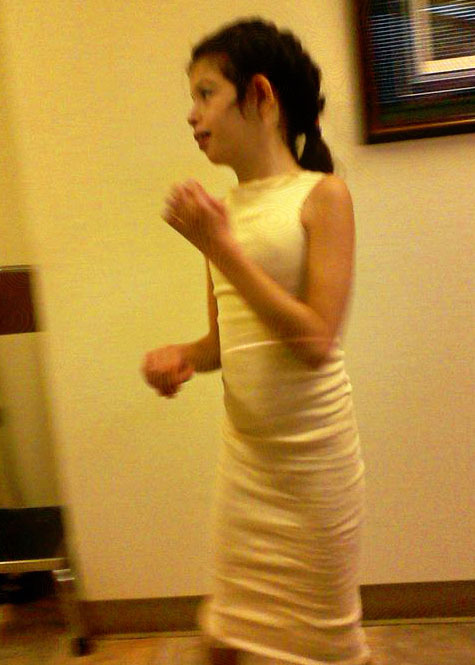 First she put on this “dress”. I had to take a picture because Olivia looks like a supermodel in everything. Even this little piece of cloth that was there just to protect her skin. Then she climbed into the torture chamber. 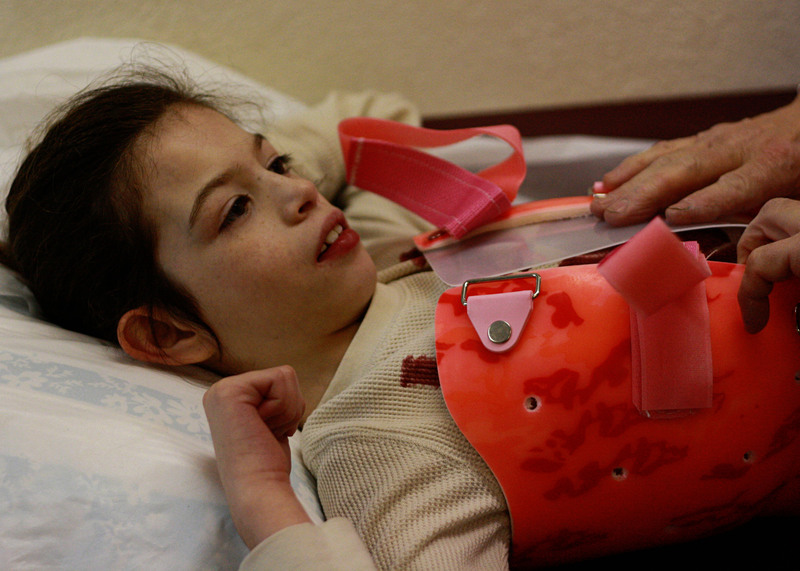 They had to put her in traction, basically, to make her spine super straight and as extended as possible. I guess this is why this orthotics place is so good; they’re the only ones that do it this way. 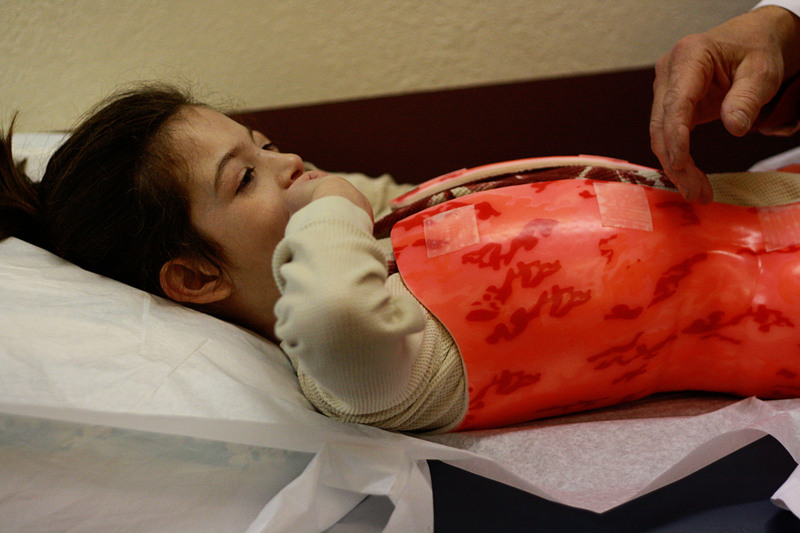 We’ve been going there for years for her foot orthotics, but this was a whole new experience! They quickly put on the plaster and made the cast. Then the scary scissors came out and they cut it off. Scary. We waited about a month for the real cast. The real cast took about 2 hours to finalize so I left the boys with my mother-in-law for this appointment. I took a new movie too!! She was a little nervous; you can tell because she puts her whole hand in her mouth when she’s nervous. 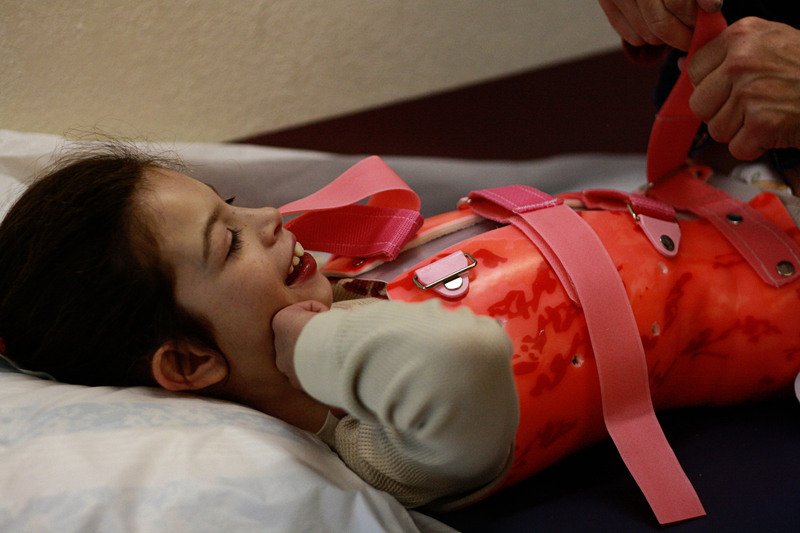 The orthotist tried it on and made a few adjustments and then took it away to finalize. We watched “How to Train Your Dragon” and cuddled. It was actually really nice even though we were at the doctor!! He brought it back and fitted it. I honestly about lost it. It looked so painful and terrible; I just couldn’t believe that she had to wear it every day for 12 hours. I held it together at the office. She was all smiles and was giggling. She inspires me so. We got home and I just lost it. I cried in front of the kids, which is something I try really hard not to do. I just couldn’t bear it. I couldn’t stand the thought of my little girl having to be put in this thing every night. I felt so terrible and guilty it was almost too much to handle. 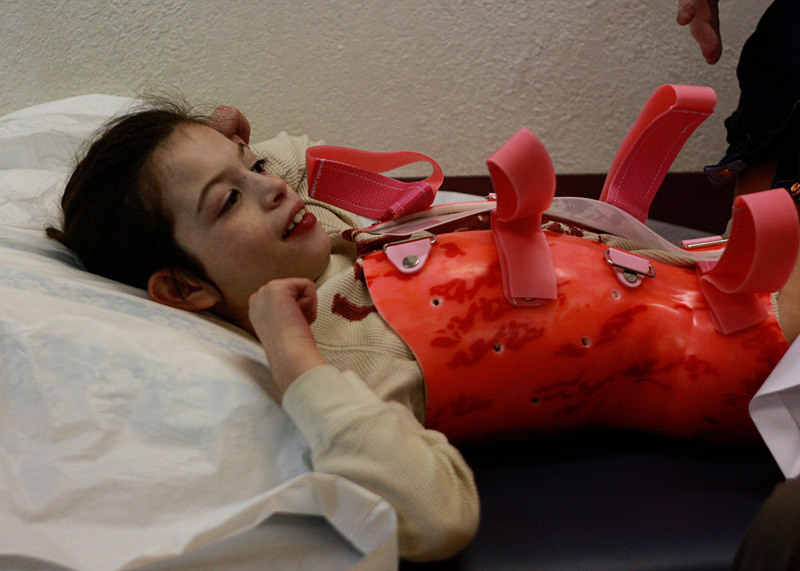 I know, it’s just a brace, but to me, it’s just one more thing that she has to endure. I cried myself to sleep that night. I couldn’t help it. I didn’t sleep at all; I was worried she would not sleep or wake up crying. They warned me she might be in a lot of pain like when you get braces on your teeth. She slept all night. Not a peep. She’s such a champ. I learn so much from her. The next night we made a joke about it. We started calling it her “turtle shell” and knocking on it and doing knock-knock jokes. She loves it. She asks to put it on. I don’t know where this girl gets her strength from. She amazes me. Now every night, we march upstairs to find the turtle shell. We do the same knock-knock jokes while we get it on (it’s quite a process!). And then she lays down and goes to sleep. What an angel. And I marvel at her strength. How she just does what’s necessary with a smile on her face. My little pink turtle. She is the most amazing little girl! I am sorry you have to endure all of this with her but it makes you both stronger. The bond you two have is undeniable. My prayers are with you both that this continues to be a tolerable thing! Merry Christmas! These pictures sure bring back memories for me. 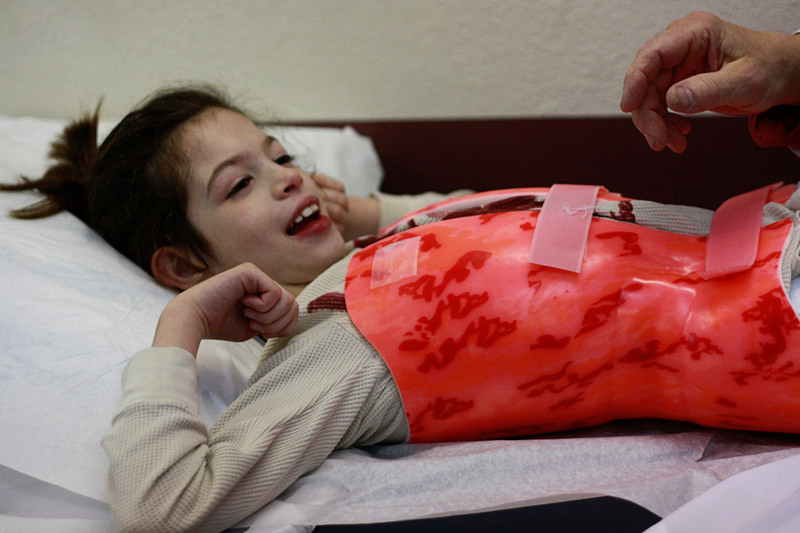 I was 13 years old when I went through this same process for a back brace. I love that Olivia’s is colorful. Mine was just plain beige. And I hated that “saw”. I agree, scary! I was convinced I was going to be cut right in half! I hope you know it’s okay when you experience mommy-moments that are just plain hard. It is hard watching your kid have to go through so much extra. 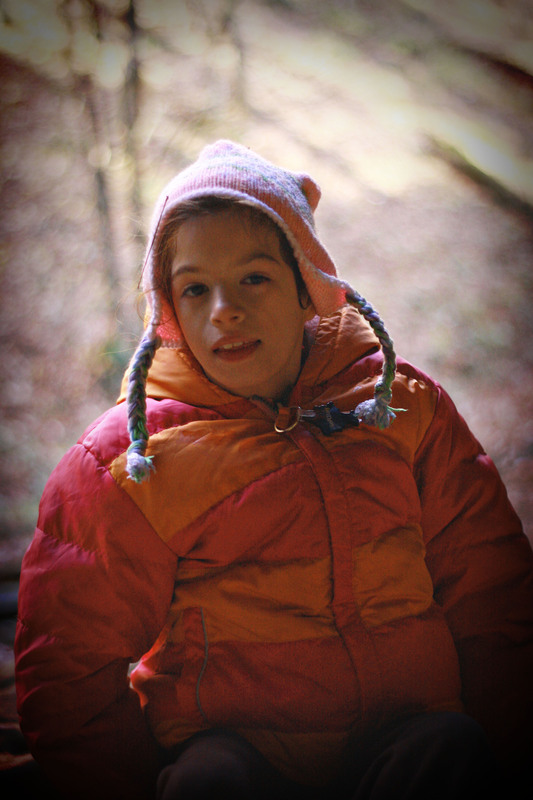 Life feels complicated enough let alone all the other stuff the special needs can bring on. The knock-knock jokes on it are so great! Just another reason why you ones are such a remarkable family. You are both a copuple of tough cookies!! I’m sure you both get the strength from each other and those around you. “I don’t know where this girl gets her strength from.” – It’s YOU silly. She gets her strength from YOU! She is quite an amazing young girl indeed. Good post – it helps to share the whole experience for people who may have to go through it later. She is one brave cookie! Like the pattern she chose too. She is amazing. Without a doubt. And I think her embracing of her turtle shell can teach us all something. Thanks for sharing. You are both amazing! You find strength through each other. Another amazing feat for the two of you! What an amazing young lady you have there. Very impressed with her adaptability and acceptance. That says a lot about your strength in the face of adversity too. Wow What a trooper!!!! I know exactly how u feel. I took Bella to the dentist last week and she hates going in, we fell cause I had to pull her out of the car, and i bumped my head on the curb, and it took all of me not to cry and put on my happy face. but wouldn’t u know it she came out smiling and happy. And i went home and had a glass of wine. I have to agree with everyone else, she’s absolutely, positively amazing. As is her mother. Just awe-inspiring. Wow. She really is a strong little girl. Hugs to you . She is amazing and inspiring! So are you momma! Wow she is soooooooooooooo brave!! I couldn’t imagine the pain or discomfort. My niece (who too has Cri Du Chat) puts her whole hand in her mouth too. She is too young to understand why she does it. I just love Olivia, and I haven’t even met her! Don’t worry about crying in front of your kids. I personally think it is healthy, it shows them how to process emotions. Well that is just my personal thought. Thank you for having a blog. I love following everything and the way you write! Okay, just cried when I read this. I totally get what you mean about the “just one more thing,” I cried and cried when Ella got her glasses for that same reason (and I totally understand that glasses aren’t anything like a back brace.) And like Olivia Ella took to her stupid glasses like a champ and proved to me that it’s no big deal to her. Olivia really is a champ, I think I would have some chlostrophobic freak out in that thing. I love that you do the jokes, you are such a good mommy!!! Thank you so much for posting this experience the way it was. We have escaped the brace (for now), but they gave us a DVD to take home that was all smiley and happy about it all. Your posts are so much more helpful and REAL. You and Olivia are my heroes! Olivia: You are such a brave and perfect lil girl. I love you without even knowing you…how can that be? You may never understand how much you touch people lives but we want you to know that we are here listening…going thru everything you go through. We are always right here by your side. btw: ur the cutest lil turtle ever! !